← Poll: would you like additional recycling facilities for plastics in Crosspool? Our three councillors, Sylvia Anginotti, Rob Frost and Geoff Smith, have recently met with First and South Yorkshire Passenger Transport Executive (SYPTE) to discuss the 51 bus route. A report from the meeting, written by the councillors, is below. If you have comments regarding this then the best way to get in touch with them directly is via the contact details on the Sheffield city council website. 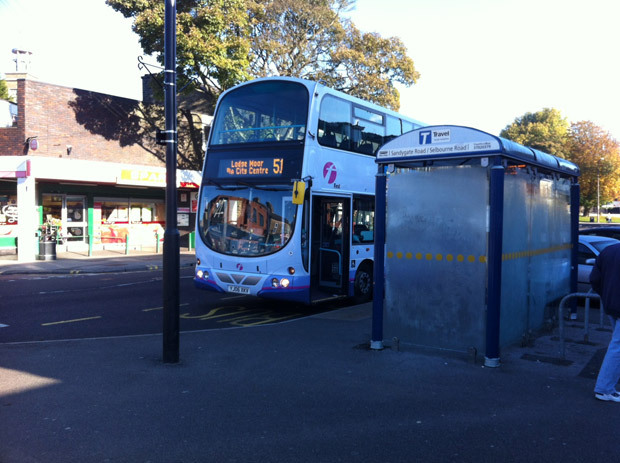 The three Crookes councillors (Sylvia Anginotti, Rob Frost and Geoff Smith) have been made aware by individuals and through the Crosspool Forum of dissatisfaction with the 51 bus. In particular with the failure of buses to run at the published times. We were going to have a meeting with First and South Yorkshire Passenger Transport Executive (SYPTE) in January but unfortunately the bad weather forced a postponement and we were not able to meet until March. You will remember that we were promised an improved service when the Bus Partnership arrangements started at the end of October 2012. This was going to be achieved in two ways; an additional bus on the route and a change of route to avoid Broad Lane. The additional bus was put on but the change of route didn’t happen. This was because of the number of people who protested that they would not be able to get to the NHS walk in service. SYPTE figures for complaints show a continued high level of complaints up to January of this year and then a falling off. This could be for either of two reasons; people have become fed up with complaining or there has been some improvement in the service. SYPTE’s own figures for punctuality at stops on the route show an improvement from 72% punctuality pre-October 2012 rising to 84% recently. This is against a target of 95%. So even by their own figures there is still some way to go. First admit that punctuality is still not good enough. They said that double deckers were part of the problem and that from early July they will be replaced by brand new single deckers which along with ticket issue speeding up should speed up overall loading times. They are also putting an additional bus on the route on Saturdays from the end of April and making minor timetable changes. They gave us a list of traffic hotspots on the route which cause problems and we will be taking these up with the Council. Also they warned that the service could be affected by planned roadworks across the city. We will continue to have meetings with First and SYPTE. We will welcome your views and experience at the next meeting of the Crosspool Forum and please keep on complaining to SYPTE if you have problems with the 51. This entry was posted in council, crosspool, roadworks, traffic, transport and tagged 51, bus service, buses, crookes, first buses, geoff smith, rob frost, sheffield, silvia anginotti, sypte. Bookmark the permalink. Given that the timekeeping was poor before the double deckers were introduced, I’m not clear why it should improve by bringing back single deckers. Presumably the DD’s will be moved to a different route, which will then deteriorate? According to figures in the article the punctuality has risen since they started using double deckers (last autumn I believe?) & yet First then contradict this by blaming them for poor punctuality.